What is a "direct connection" vs "Allow connections over the internet via ZecWallet wormhole"
How can I ensure that only direct connections are enabled? What data can the wormhole service see? Will it always connect via the wormhole service? How can I connect over the internet without using the wormhole service? The Android app is beta software. Although everything will work fine on mainnet, since this is beta software, it is recommended you run it on the Zcash testnet. Add testnet=1 into your zcash.conf to enable the testnet. ZecWallet Android is an Android frontend for ZecWallet that lets you send and receive shielded payments from your mobile phone. It is available on the Google Play Store or via direct download of the APK. In order to let your Android phone connect to your desktop, you need to run the desktop ZecWallet. After your node is synced, go to Apps -> Connect Mobile App to view the connection QR Code, which you can scan from the Android App. If you’re installing the APK directly, you’ll need to allow Install from untrusted sources on your Android phone. When your phone and your desktop are on the same network (eg. 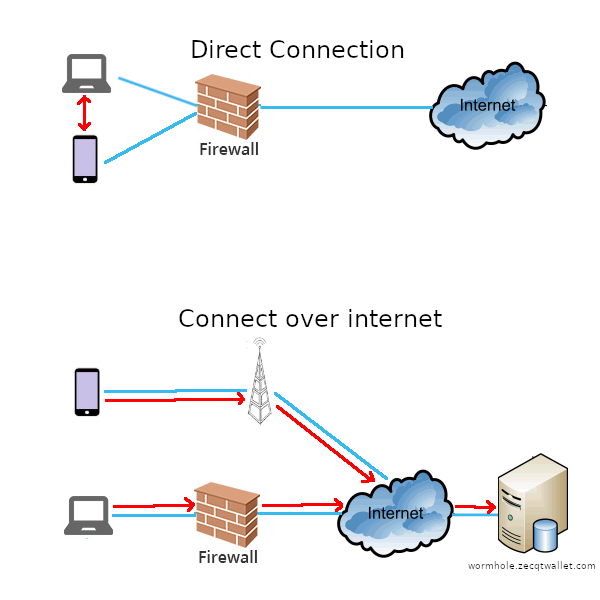 on your home network), your phone can directly reach your desktop over your local network (if there are no firewalls blocking the connection). In this scenario, your phone directly communicates with your desktop ZecWallet. This is the default. If your phone is on a different network (if you’re connected via 4G/LTE, for example) or if your desktop ZecWallet is behind a firewall, your phone can’t directly reach your desktop. In this scenario, your phone and desktop both connect to a service run by ZecWallet (called wormhole.zecqtwallet.com), which routes information between your phone and your desktop. This is already the default. 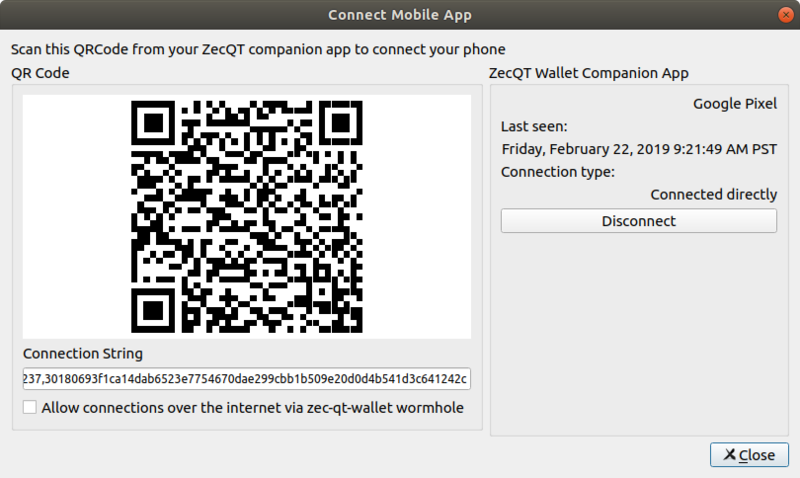 If you want to connect over the internet via wormhole.zecqtwallet.com, you will need to opt-in by checking the Connect over internet via ZecWallet wormhole checkbox on the connection page. You can also disable connecting over the internet via ZecWallet wormhole in the Android app’s settings. All communication is encrypted end-to-end, so the wormhole service can’t see the content of your messages. It can see some meta-data like the IP addresses and date/timestamps. Both your phone and your desktop connect to wormhole.zecqtwallet.com over HTTPS. The Android app will first attempt a direct connection each time you open the App. If a direct connection is not possible, it will then attempt to connect via wormhole (if enabled). You’ll need to install a VPN on your home network, so you can VPN into your network from 4G/LTE networks, and then connect directly to your node. For example, you can use a service such as Pi VPN. Old-style Sprout addresses are not supported. You can’t select which address to send from. ZecWallet will try to send Transactions from a Sapling address, given you have enough balance. You can’t generate new z-addrs or t-addrs from the phone. Please file all the feedback you can. You can file issues in the issues tab.